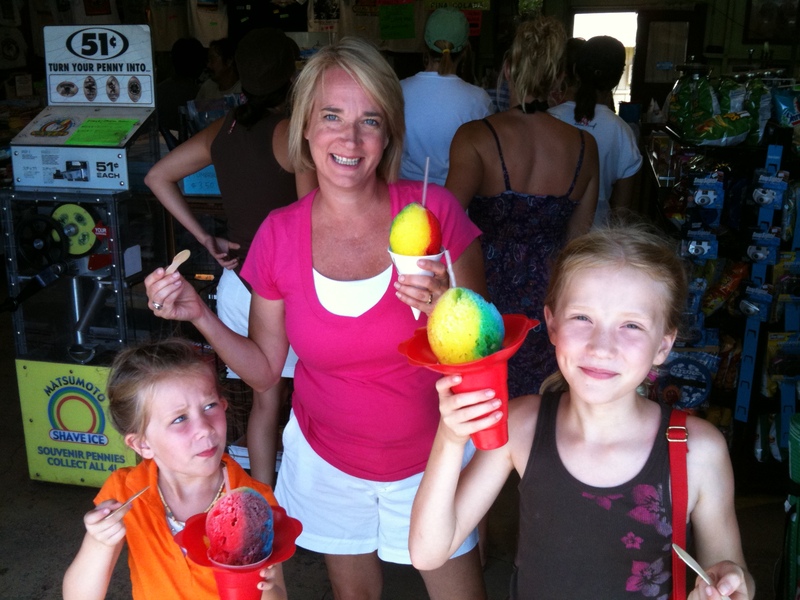 Shave Ice in Hawaii – Join the Island Tradition! Every time I stop for shave ice in Hawaii (or, more accurately, stop so my kids can get a shave ice), I wonder “where did this stuff come from?” After all, it could be called the most popular snack in the islands. Elsewhere on the mainland, you’ll find shave ice for sure (or snow cones as the’re called). But, I can’t recall ever seeing a store dedicated solely to shave ice. And, it certainly wasn’t a staple for this girl who grew up in Georgia. According to the Honolulu Star Advertiser, shave ice came to Hawaii by way of sugar plantation laborers from Okinawa and other parts of Japan, where eating kaki- gori — the Japanese term for sweetened shaved ice — dates to the royal families of the Heian period. Matsumoto's shave ice in Haleiwa is legendary among locals. Matsumoto's sports more than 30 different flavors daily. The paper reports that Japanese immigrants opened small stores to serve plantation workers in the early 1900s, some of which sold shave ice. By the 1950s shave ice was sold regularly at many Japanese-owned mom-and-pops such as M. Matsumoto Grocery Store on the North Shore. Now operating as Matsumoto Shave Ice, the place continues to be so popular that waits can stretch past a half-hour. So, what makes a good shave ice? Steven Parker told the paper that a good shave ice begins with a machine that has a sharp blade and a block of ice that has been tempered on the counter or in the refrigerator so it has a sheen from melting a bit. According to the paper, the goal is to create soft flakes that resemble fresh snow and can absorb generous pours of syrup. Pebbles of crushed ice, which make up the snow cones of countless mainland American county fairs, are so hard that the syrup drains to the bottom of the cup. It's not unusual to find happy faces, and long lines, at Matsumoto's Shave Ice. A skilled shaver must have the patience of a good barista, Parker told the Honolulu Star Advertiser, catching the ice as it falls from the blade and gently packing the flakes into a dome firm enough to hold syrup but still soft enough that it will yield easily to a spoon. After a morning of watersports, hiking, or sightseeing, nothing tastes better than a shave ice! And, now that you know the history behind this cool, flaky, sweet treat, it will tastes even better!